There are a mere three days remaining before the initial deadline to avoid sequestration and a fix remains unlikely. One way to grasp the impact of the budget cuts is to analyse which states will see the biggest economic fallout. Back in November, the Pew centre on the States released a groundbreaking report discussing how sequestration — back then a portion of the fiscal cliff — would impact Americans on the state by state level. Notice that the D.C. metro area would take a big hit in the event of budget reductions, but states like New York come across relatively unscathed. 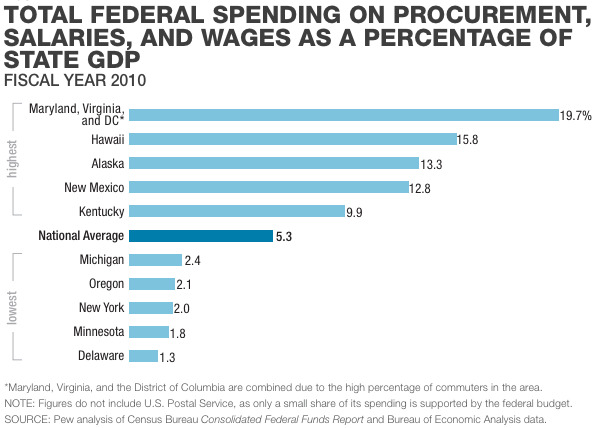 Cuts in federal procurement and salaries and wages could slow economic activity, and thereby adversely affect state finances by reducing state personal income and sales tax revenues and increasing demand for state-funded income support programs. 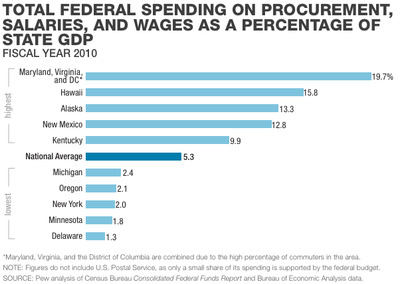 Again, the effects on states would vary, based on the level of such federal spending in the state. As such, Delaware probably will not see too much pain, but the Washington D.C. metro area — including parts of Maryland and Virginia — is going to feel sequestration roughly four times harder than the national average.